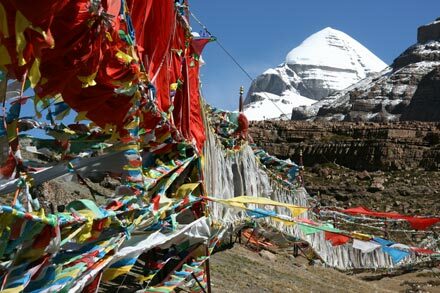 Our first day on the Kailash kora was full of ups and downs to say the least – and I’m not talking about the trail. It all started at 9 AM when our porter showed up and quit! Losang, our guide, shifted into emergency mode and desperately combed the small town for anyone available. At 11 AM, he showed up with a scrawny, frail, old man whom we immediately hired because we had no other options. 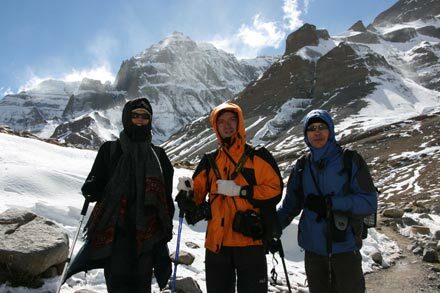 We needed a well acclimatized local to help us carry our things as well as to guide us over the snow-covered pass. This was doubly important as Losang was not going to come with us because his shoes were not good enough to walk through deep snow. Guide hired and ready to go, we all grabbed our bags and left immediately – a very late start for our first day which included a trek of 20 km (12 miles). As we headed up the hill behind Darchen, it quickly became clear that the porter wasn’t going to make it with the backpack packed the way it was, so we each took some of his load into our daypacks to help him. We were a bit stressed because of the late start and the fact that we were terrified that our porter was going to drop over dead, but once we came up over the first ridge and saw a massive circle of prayer flags backed by the full view of Kailash, our worries were suddenly forgotten (for the moment). Passing the impressive collection of prayer flags, we oohed and aahed as we entered the stone canyon that marks the beginning of the kora like some colossal stone gate. You really feel a sense of awe as you approach the exceptionally unique mountain, which is one of the holiest pilgrimage sites for Buddhists, Hindus and Bon worshippers. 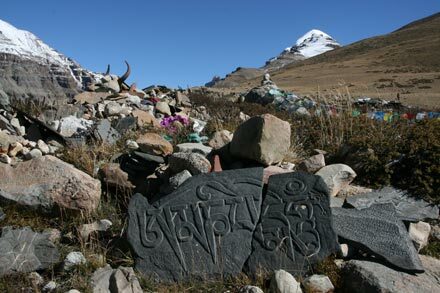 The path was lined with mani piles and mani walls including stacks of yak skulls (many of which had also been engraved with Tibetan prayer texts). We passed stone stupas, smaller collections of prayer flags, and our first monastery perched on a steep cliff overlooking the trail. It was all absolutely magic… until we saw the cars. Cars… driving up the riverbed below us. How could anyone be driving cars up the holiest pilgrim path in Tibet?! We assumed it had to be Chinese tourists as Tibetans would never drive in such a holy place. Or perhaps, Chinese military following up on their bombing of the 10 meter (30 foot) Buddha, making sure Tibetans weren’t carving another “unauthorized” statue somewhere in the cliffs. We bitched and complained, we mourned the loss of Tibet. Boy, did we feel like idiots when we discovered the truth. Suddenly, out of nowhere, our guide Losang appeared on the path ahead of us. “Hello,” he said, offering no explanation of his presence. “Losang, what are you doing here?” we asked totally confused by how he had suddenly materialized ahead of us on the trail. We stood there, unsure what exactly to say about the discovery that the cars were actually going to pick up someone’s body. Then it sank in that the person had died crossing the pass we were heading for. We walked on silently reflecting on what had happened, questioning what we should do next. After about a half an hour, we saw a group of people walking towards us, quite unusual as they were walking the kora counter-clockwise (a big taboo in Tibet). It was a group of European hikers who had heard about the German’s death and had decided to turn back. This really started to make us nervous. After another hour, the cars drove back by us carrying the man’s body back to Darchen. There was another man sitting in the back staring out the window. We discovered from Losang that this was the man’s brother. We stood back silently watching the cars drive by us on the narrow path. I can’t tell you how incredibly strange we felt as the dazed brother’s eyes glided over us. I felt so horrible for him. But we walked on. The landscape was so other-worldly, so spectacular that is compelled us to continue. 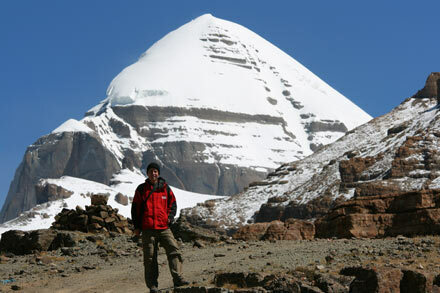 Kailash, such a unique mountain, is like a monolithic slab of stone, or perhaps, an ancient pyramid ravaged by the extremes of the Tibetan climate. The mountain exudes a sense of natural spiritual wonder, which has made it such an important pilgrimage site. In Tibet, the land of mountains, Kailash is by far the most important, surpassing all others including Lhotse, Cho Oyu, Xishabangma, and even Everest. As the day wore on, the winds picked up whipping snow off the tops of the surrounding peaks, perhaps foreshadowing what lay ahead. From time to time, we stopped to take refuge from the strong winds in pilgrim tea tents refueling on salted black tea, butter tea, or instant noodles. Eventually, the canyon trail curved gently around to the northern face of the mountain, known as the Emerald Face, where we came to our end destination for day one, Dira Puk Monastery. Later that evening, as we sat around the yak dung stove warming ourselves, we tried to get as much information as possible about the German’s death and the conditions at the pass. Some said he had died of altitude sickness, others said he had fallen due to the strong winds, still others said he had had a heart attack. At times, it sounded like his death was a freak accident, at others it sounded like a direct result of the weather. After considering the situation, Dimitri, Irina, Thomas and I have decided to attempt the pass, but we are going to be respectful of the weather conditions. If it looks too dangerous, we’ll head back. 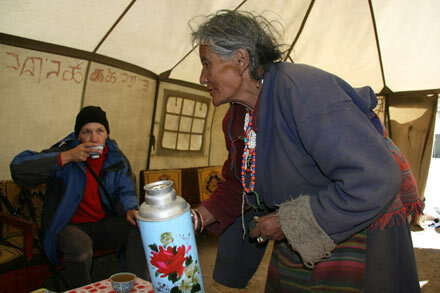 We aren’t the only ones to attempt the pass, there are other foreigners and many Tibetan pilgrims who are going as well. Hopefully, everything will be much clearer tomorrow. 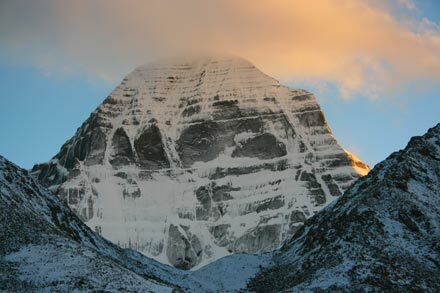 Continue reading Mount Kailash – Day 2.